Summer is the time to have fun and enjoy in the sun. It is a time for lazy swims in the pool or weekend picnics in the park. 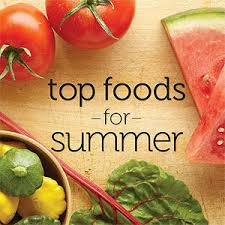 But summer cannot be complete without some delicious foods to snack on. But having everything and anything may not be a very good idea. The idea is to eat cool refreshing foods that don’t upset your stomach or heat up our body. If you consume too much of heat-generating food, it can lead to summer boils or rashes, diarrhoea, acidity and other digestive problems. Summer is also the time when the body gets dehydrated due to loss of moisture. Keeping your body hydrated is very important in summer. Eating light is the key here. Spicy food- spices can make your stomach burn. They are not healthy when consumed in large proportions. So try to avoid spicy food as much as possible. Don’t put too much of cinnamon, ginger, garlic or turmeric in your food or it can lead to diarrhoea. Sauces- avoid having sauces, especially chilly and cheese ones. Some sauces may have MSG’s which is best to avoid as much as you can. Mustard oil- mustard oil can be too rich in the summer. Instead, you can use olive oil which is a much healthier option. Oily food- too much oil is never good for your health. Have meals that don’t contain a lot of oil. Junk food- junk food is a strict no-no in summer. Hamburgers, chips or French fries contain a lot of salt which is not good for your health. 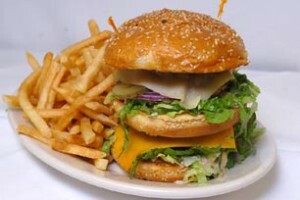 Fried food- similar to junk food, fried food does no good for your body. Also, roasted food is also not very good as it can also give out heat. Aerated drinks- soft drinks like cola are not good in the summer. Coffee- tea and coffee are some beverages which you should steer clear of in summer. The caffeine in the drinks can make your body dehydrated. Red meat- Give red meat like mutton, pork, beef or lamb a miss this summer. Prawn and egg- apart from red meat, other non vegetarian dishes having to do with prawn and egg also generate heat in the body. It can upset your stomach. Milk- Stay away from all dairy products in the summer. They can cause acidity. Mangoes- now this mouth-watering fruit may be difficult to avoid, but too much of mangoes can actually give you boils and heat rashes. If you can’t avoid it completely at least have less. 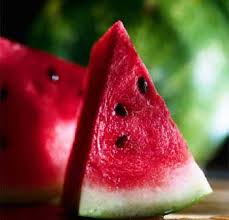 Watermelon- watermelon, as the name suggests, pumps the body with a lot of water. So enjoy this juicy fruit this summer. Homemade yoghurt- the only dairy item that is advisable in summer is yoghurt which is cooling and refreshing. Fruit juices- summer time gives you a wonderful opportunity to have as many fruit smoothies as you want. Use fresh fruits like papayas, watermelons, kiwis, litchis and strawberries to make delicious smoothies. Don’t forget to add lots of ice. Chicken- chicken can be easily replaced with the red meat you have been told to avoid. Cold salad- a light and refreshing cold salad is a summer’s delight for all. Green vegetables- who can forget the importance of green leafy vegetables in the summer? Have lots of veggies like cabbages, spinach, beans, carrots, celery and tomatoes this summer. Green tea- while normal tea contains caffeine, green tea is absolutely caffeine free. In fact, it contains a lot of antioxidants which supply oxygen to the skin. Mint- mint can be very cooling for the mouth and tongue. Try to incorporate mint in your diet. Red onions- red onions have quercetin in them which is actually anti-inflammatory properties that prevent heat rashes or boils. Cucumber- probably the coolest food in summer is the cucumber which supplies the body with a lot of hydration. Combine it with yogurt and spices for a delicious dip. Potato salad- a little amount of carbohydrate keeps the energy levels up during summer. So try and have foods that contain potato, especially salads. Corn- finally the antioxidant rich sweet corn is the last food on our list. 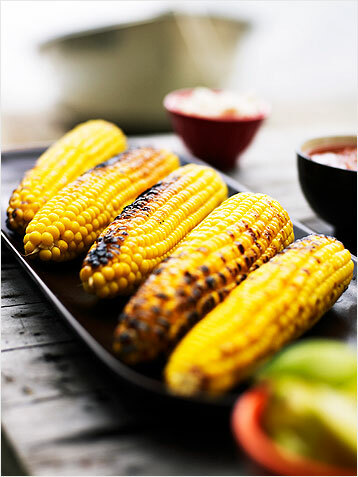 Give those hamburgers a miss and opt for a corn on the cob instead. With so many yummy delicious foods to choose from, having a scrumptious meal in the summer could have never been easier. Mix and match the different ingredients to make a delicious meal of your choice. Don’t forget to consume lots of water to keep the body hydrated. That is why; drinking fruit juices is a must in summer. While coffee and tea make you dehydrated, fruits supply additional moisture to the skin. Don’t restrict yourself too much or you may end up losing the whole point of summer, which is enjoying to the hilt. Even if you end up eating some rich spicy meal, compensate it by having lots of fresh vegetable salads.